Rajinder Singh, a drug addict from Moga district, who had been under treatment in a de-addiction centre at Indora in Kangra district, was beaten to death by centre workers. Health Minister Kaul Singh Thakur has urged the Centre to give additional financial assistance for connecting those gram panchayats with road which are important from tourism point of view. The Himachal Assembly will showcase its e-Vidhan project to several state assemblies and the IT departments of various states at the conference of IT ministers in New Delhi. Vidhan Sabha Speaker BBL Butail is expected to deliver his judgement on Independent MLAs next month. He has received replies from four Independents with the BJP seeking their disqualification for associating with the Congress. BJP councillors today sat on a dharna outside the municipal committee office, alleging bias against them. They alleged development works in their wards had not been completed. The high court today directed the Income Tax Department to produce the entire record of transfer of investigation into the tax returns of Chief Minister Virbhadra Singh and his family members from Shimla to Chandigarh. Passing this order, a Division Bench comprising Chief Justice Mansoor Ahmad Mir and Justice Tarlok Singh Chauhan further directed the IT Department to produce it before the court on November 24. The option of “None of the above” (NOTA) will be introduced for the first time in Panchayati Raj Institutions byelections slated for November 30, State Election Commissioner TG Negi said here today. The 36 students of Government Primary School (GPS), Mangal, in Arki block have been shifted to a make-shift building since the local authorities failed to construct the new building that lacks basic amenities. The authorities were to construct an eight-room building with the Rs 14 lakh received from the National Thermal Power Corporation (NTPC). Wild animals have destroyed nearly 50 per cent of the recently sown wheat crop in several villages of the district. State Youth Congress president Vikramaditya Singh, has requested Chief Minister Virbhadra Singh to take up the matter of missing Leading Mechanical Engineer (LME) of the Indian Navy, Sangam Sharma, with the Government of India. The first result, declared by Himachal Pradesh University under the Rashtriya Utkrisht Shiksha Abhiyan (RUSA), has sprung a surprise. Some students, who had not appeared in the exams, have been declared pass and those who had scored zero marks in the internal assessment scored 80 per cent in the results declared by the university. A two-member delegation of the Mongolian University of Life Sciences (MULS) reached CSK HP Agriculture University (CSKHPAU) and held a meeting with the university administration today. The employees of Central government departments of post and telegraph, accountant general office and other departments, today protested in front of the office of state auditor and comptroller, demanding regular appointment and payment of arrears. “Journalists should work like professional truth tellers and truth should be the only ingredient of any news”. Even as JP Cement’s first plant at Bagha is embroiled in various controversies, the management has put forth a proposal to set up a second plant. Dalhousie Public School, Dalhousie, celebrated its annual investiture ceremony for the academic session 2014-15 today. Deputy Commissioner of Chamba M Sudha Devi was the chief guest. DC M Sudha Devi gives away prizes to students, while Dr GS Dhillon, Director-Principal of DPS, looks on in Chamba on Tuesday. The Postal Department offices in the state will be providing core banking and ATM facilities to customers, said Chief Post Master General, Shimla Zone, AN Anand. He was presiding over a customer’s meet organised at the General Post office here today. Four youths on Tuesday looted a luxury car on the Kandwal-Pathankot road by thrashing its driver Anil Kumar of Nagabari. A man and his nephew were killed in an accident near Chhatri in the Seraj valley of the district on Tuesday. His body was disposed of at Shahpur in the district which was recovered by the police today. Sources said some people from Moga district had opened a de-addiction centre in Indora about a year ago in a rented premises. Thirty drug addicts from Punjab were under treatment. They were subjected to inhuman treatment. On November 11, an inmate Rajinder Singh was beaten to death by centre workers there. The workers then disposed of the body in a forest of Shahpur, about 60 km from Indora. Another inmate Sukhwinder Singh reportedly rang up the kin of deceased. The parents of the deceased came to Indora yesterday and lodged an FIR. Sukhwinder, in his statement to the police, has said the workers at the de-addiction centre had beaten up Rajinder Singh on November 11. He, however, succumbed to injuries. ASP Kangra Shiv Kumar said three of the accused had been arrested. They are Balwinder, Mintu and Nikka. Nikka was arrested today from Moga district. On the basis of information provided by the accused, the body of Rajinder was discovered from the forest area in Shahpur. Further investigation into the case was still going on to uncover the operations going on in the de-addiction centre. A case under Sections 302, 201 and 34 of the IPC had been registered against the accused, he said. The other accused are Kamla, Lavdeep, Gaggi and Satnam. Sources said with the number of drug addicts soaring in Punjab, the business of de-addiction centres is flourishing here. The people running the de-addiction centres charge hefty amount. In the centres, the drug addicts are allegedly beaten up by untrained staff and even chained. 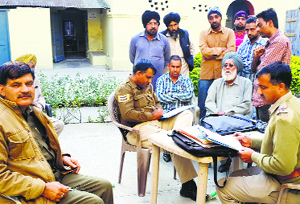 The police were investigating as to why the people from Moga district of Punjab were brought here. The police were also investigating as to why the people opened drug de-addiction centre in Himachal. He also sought the release of the sanctioned amount under MGNREGA so that the pace of development could be maintained. He raised these demands with Union Minister for Rural Development and Panchayati Raj Birender Singh during a meeting in New Delhi today. Kaul Singh informed him that the state government had formulated an ambitious plan to connect all panchayats with road in a phased manner for which additional finances were required. Most of the panchayats had already been provided road connectivity and now target had been fixed to connect all villages, he said, adding that there were many historical temples in far-flung areas of the state, particularly in Kullu and Mandi districts which needed to be connected with roads. He said the MGNREGA scheme was being implemented in Himachal Pradesh and the rural population had been benefited out of it. He urged the Union minister to release the amount under MGNREGA which had been curtailed to almost half. Efforts of Himachal Pradesh for cleanliness campaign had been appreciated at the national level and financial assistance from the Centre was required to carry out this campaign, he added. 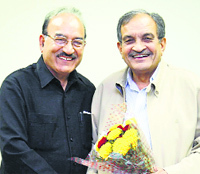 The Union minister assured him that all possible assistance would be provided to the state. Assembly Speaker BBL Butail said here today that the IT wing of the Vidhan Sabha was all set to make the session at the Dharamsala Assembly paperless. “We are in the process of implementing it so that the extended winter session can also be paperless. This will save more than Rs 5 crore,” he said. “I have received an invite from Union Minister for Communications and IT Ravi Shankar Prasad not to just hold a national conference of Speakers of all assemblies in Shimla for knowledge sharing and experiencing the impact of e-Vidhan, but also showcase the project at the conference of all IT ministers and secretaries in Delhi,” said Butail. He said he had received queries from several states such as Uttar Pradesh, Kerala, Karnataka and Nagaland to show these the way in making their assemblies paperless. “It is the dream of our Prime Minister to make every office paperless and this will help in saving thousands of trees which are so important for our environment,” he said. Butail said the e-Vidhan project in Shimla had cost Rs 8 crore and the cost for doing it in Dharamsala would be Rs 5 crore. He added that the entire expenditure would be borne by the Union ministry. Butail, while admitting that there was no need for another Assembly at Dharamsala, said the complex must be put to maximum use. He said the cost for holding five-day session at Dharamsala worked out to be about Rs 1 crore, excluding the expenditure made by other departments. Butail said very shortly the constituency management plan which would help the MLAs to monitor the development works and progress in their constituencies would also be launched under the e-project. An indication to this effect was given by Butail who said he would give the final verdict within a month. “Very shortly, I will collect all facts and figures so that the verdict comes within a month,” said Butail here today. It was on September 2 that the BJP had filed a petition before the Assembly Speaker seeking disqualification of the four Independents - Karnesh Jung (Paonta Sahib), Manohar Dhiman (Indora), Balbir Verma (Chopal) and Pawan Kajal (Kangra). In their petition, the BJP had cited violation of Schedule 10 of the Constitution and the Anti-Defection Law for seeking the disqualification of the four MLAs. Butail, however, denied that it was mandatory for him to give the verdict within four months. “There is no binding or ruling that I have to give the pronouncement in four months but yes I will be able to do it within a month,” he said. BJP sources said if the Speaker’s verdict was in favour of the Independents, the decision would be challenged in the high court. Though three of the four MLAs, barring Verma, won as BJP rebels, they had been aligning with the Congress to get development works done in their Assembly segments. The four MLAs had come under fire from the BJP when they had pledged support to the Virbhadra government during the monsoon session. The BJP, in its petition, had sought their disqualification on the ground that they had become associate members of the Congress Legislature Party (CLP) and had issued statements supporting the government. The MLAs, on the other hand, in their reply filed jointly, have stated that they had only extended outside support to the Congress regime and had not become its associate members. They had said they sit separately in the Assembly and were not Congress members as being claimed by the BJP. The BJP’s petition assumed significance following disqualification of the five MLAs of the Haryana Janhit Party by the Punjab and Haryana High Court. These five MLAs in Haryana had defected to the Congress in 2009. The court verdict had raised the expectations of the BJP as they felt that the four Independents in Himachal could have the same fate. Though there were five MLAs who had won as Independent in the 2012 elections but one of them, Rajinder Rana had resigned to contest the Lok Sabha election from Hamirpur on the Congress ticket. He lost the parliamentary election and his wife, who contested the Assembly poll from Sujanpur, also faced defeat. Led by vice-president of the local Municipal Committee Pawan Gupta, five of the eight councillors alleged the pace of work had been slow even though they had taken up the issue with the directorate of urban development. They threatened to intensify their agitation if the works were not completed by December 31. Gupta complained about the fact that the Executive Officer (EO) posted at Solan was looking after two more municipal committees, including Rajgarh and Rampur. He alleged the Executive Officer was only available for around two days in a week in Solan. Until recently, the Executive Officer also looked after Arki. Gupta said all developmental works such as repair of roads, street lights; and clearing building maps were stuck in red tape. He further alleged even though a sub-station had been commissioned, drains were not cleaned and there was shortage of water. He said despite the fact that the authorities announced single window clearance, several projects had not been okayed. Earlier, BJP councillors had protested when building maps in wards had not been cleared. The Bench passed this order on the petitions filed by Virbhadra Singh and his family members challenging the order of the Income Tax Commissioner to transfer their cases to Chandigarh on the ground that this order was illegal and coordinated and joint investigation of all cases could be done in Shimla also. Apart from Virbhadra Singh, his wife Pratibha Singh, son Vikramaditya Singh, daughter Aprajita Kumari and Anand Chauhan (caretaker of Virbhadra’s orchards), Chunni Lal Chauhan (proprietor of Universal Apples) had challenged the orders of the IT Commissioner in the court. In its earlier order passed on August 4, the high court had stayed the order of the IT Commissioner, Shimla, whereby he had ordered to transfer the cases relating to investigations into the income tax returns of Virbhadra Singh and his kin from Shimla to the DC of Income Tax, Central Circle-I, Chandigarh. The court had also dismissed the preliminary objection raised by the IT Department against the petitions filed by Virbhadra and his family members. The court has now posted the matter for November 24. The option was exercised by voters during the Lok Sabha poll in May 2014 and an additional button was provided in electronic voting machines but in panchayat elections, ballot papers will be used and a sticker be pasted on the ballot paper to enable the voters to reject all candidates if they so desired. “The polling in 251 panchayat wards and one municipal ward (Sarkaghat in Mandi district) will be done through ballot papers and five votes be polled by individual for zila parishad, panchayat samiti, pradhan,up-pradhan and member of gram panchayat and a slicker would be put on the ballot papers which had already been printed for exercising option of NOTA”, Negi added. The NTPC has acquired land, where the old building was located, to construct a dam. The agreement to build the 800 MW hydroelectric power project was chalked out in 2006. Though the money was transferred from the office of the Block Development Office to the concerned panchayat, the work has not been completed yet. It had even taken Rs 3 lakh more to finish the project. The school that was located at a height of 573 metre had to be shifted as the NTPC had already filled earth till 563 metre. Therefore, the local administration has directed the school authorities to shift to another location. Though students were directed not to go to the old building, 22 students turned up at the site. Sham Lal, president, School Management Committee, said the makeshift building lacked basic amenities. He said parents were not willing to send their children to the new location. Sub-Divisional Magistrate (SDM) LR Verma said the new school building would be constructed soon. He said they had only constructed four rooms due to the rise in costs. He said till the new building was constructed, they had rented a building on the recommendation of the Primary Block Education Officer. Residents of Kipper, Kuthehar and Nehalg villages under Majhwar panchayat said wild animals had damaged nearly 50 per cent of the recently sown wheat crop on nearly 1,000 bighas of the land. By the time the crop would be ready for harvesting, it would be totally destroyed, they added. They said wild animals had also damaged nearly 90 per cent of the maize crop this year and nearly 100 bighas of land under paddy cultivation had turned barren as distraught farmers had stopped growing the crop due threat of wild animals. “If attacks of wild animals continue, we will be forced to abandon our fields,” said the upset villagers. “If the government takes responsibility of protecting our land from wild animals, we can again start cultivating paddy,” said Hem Singh, a resident of Kipper, whose 5 bighas of land had become barren. Gulab Singh, a resident of Kudhed, said wild boars had literally ploughed up his wheat crop on several bighas of land. GD Thakur, a resident of Kuthed and retired bank employee, said they were forced to buy vegetables and food grains from the market as wild animals, including wild boars, monkeys, neelgai and deer had hardly left any crop or vegetable to grow. Hem Singh said he had sown maize crop on 10 bighas of land and after harvesting, he got only 4 kg. Earlier, he used to get nearly 15 quintals from the same land, he added. Prakash Chand, a resident of Kipper village, said wild boars had caused extensive damage to his maize crop on 12 bighas. Inder Singh, also a resident of Kipper village, said he had a suffered a total loss on 70 bighas land where had grown paddy and maize. Panchayat member Savitri Devi said in a gram sabha meeting they had raised the issue, but the officials present advised the farmers to grow ginger, turmeric and other such crops, but the wild animals uprooted these crops too. She said the government should conduct a survey and quantify the damage caused to the crops and pay the compensation accordingly. Divisional Forest Officer VK Babu said the state government was making efforts to bring monkey in the category of vermin. “In the Wildlife Act, if monkey is declared a vermin, then people can kill it like rat,” he added. Sangam hails from Jangel Khor village of Nadaun tehsil in Hamirpur. He has been missing from Visakhapatnam for the past 11 days. Vikramaditya Singh expressed concern over the missing LME and urged the government to extend all help and assistance to the family. He said they shared the worry and anguish of the affected family and were with them in this hour of distress. Saloni Dixit, a BA student of Dharamsala government college, said she had not appeared in English major subject. However, the result surprised her. She had been declared pass. A teacher from Shahpur government college said she had given zero to four students of BA-1 in internal assessment but they got 80 per cent marks in the subject. As per the RUSA rules, students are assessed on the basis of 50 per cent marks in internal assessment and 50 marks in theory papers. The students got full 50 per cent marks in theory paper, but cannot get 80 per cent overall marks as their score in internal assessment was zero. Many teachers are complaining of similar anomalies in the result that has been declared after about two years. The Controller of Examinations, Himachal Pradesh University, Sham Lal Kaushal said there was no surprise as the students, who did not appear in the theory examinations, were declared pass. He said under the RUSA system, the students are evaluated on the basis of internal assessment and performance in theory examinations. If a student had not appeared in the theory examination and got 45 per cent marks in his internal assessment can be declared pass under the RUSA system. At present, there is no clarity under RUSA rules whether a student has to get aggregate pass marks or both in internal and theory examinations. About the students who have been given 80 per cent marks despite the fact they scored zero marks in internal assessment, the Controller of Examinations said the percentage had nothing to do with the marks scored in particular subjects. Himachal Pradesh University has drawn flak after implementing the RUSA system in the state. Earlier, the teachers had boycotted the evaluation of examinations alleging that they were being asked to assess their own students that was against the ethics. The university also drew flak for delay in declaration of results. The results of the first semester examinations held under RUSA were declared after two years. Dr T Kherugga, president, MULS, and Dr Sukhtulg, Chief Administrator for International Affairs of the university, said they were “impressed to see the excellent infrastructure and achievements of the CSKHPAU”. Dr Kherugga said since altitude and weather of some of the areas of Himachal Pradesh was similar to their country, there was a possibility of cooperation and collaboration in many areas for the common good of the economy of both countries, he added. He said it was interesting to know that CSKHPAU had technology to advance sowing time and delay harvesting time of some of the crops which could be of immense use to Mangolia. His university was keen to send students for higher studies or develop two-year collaborative programmes for post-graduate students. Earlier, Dr KK Katoch, Vice-Chancellor, welcomed the delegation and informed them about the strengths of the university in the areas of teaching, research and extension education. He specifically informed the team about the research work in Spiti and Kinnaur, which had similar climate as Mongolia. Dr SP Sharma, Director of Research, made an elaborated presentation to the delegation about teaching, research and extension education at CSKHPAU. Rattan Gautam, Registrar, Shri Ranjit Singh, Comptroller, Dr NK Pathania, Dean, COA, Dr Sanjit Katoch, Dean, COVAS, Dr Kamlesh Singh, Dean, COBS, Dr SR Malhotra, Dean, COHS, Dr SS Kanwar, SWO, Dr PK Mehta, Librarian, Dr J Shekhar, Dean PGS, Er AK Chadha, EO, also attended the meeting with the MULS delegation. Shashi Shekhar, Editor-in-Chief, Hindustan MV, said this today while interacting with journalists, media educators and students of CUHP during a workshop on “Development Reporting: The Changing Paradigms”, organised by the School of Journalism, Mass Communication and New Media. Prof YS Verma, Vice-Chancellor, CUHP, emphasised on the need to develop an interface between the university and the society so that benefits of the resources of the university reached the community. A senior journalist said journalists working in the field should be compassionate, fair, fearless and without vested interests in approaching news stories. The case was today listed before the Arki SDM for clearance under the Forest Rights Act, where issues pertaining to rights of tribal population were discussed. Though the area has no tribal population, this has become a mandatory stipulation under the Forest Rights Act and is supposed to be implanted in all projects where permission from the Ministry of Environment and Forests is required. The plant management had proposed to set up the second plant in 172 hectares, which comprises 119 hectare of private land while the remaining is government land. About seven hectares of the land lay in Bilaspur while the remaining fell in Arki sub-division of Solan. The plant management had put forth its case for grant of mining area for the second plant, though it is surprising as to why the mining area is being sought when the plant is yet to be set up. It is worth mentioning that the JP Cement’s first plant at Bagha is mired in controversy as non-fulfillment of pollution norms had delayed renewal of its consent to operate, which had lapsed on March 31 this year. It was given a conditional consent to operate in the recent past as its pollution norms were not satisfactory. Not only this, the Directorate of Industries had worked out a penalty of nearly Rs 60 crore on its first plant as it had exceeded production capacity without the due approvals and was preparing to realise this penalty. The issue had generated much heat after Industries Minister Mukesh Agnihotri had taken a stern view of various violations involving the Bagha unit early this year and had ordered an inquiry to look into the violations. A sub-committee had been constituted to ascertain the veracity of the allegations pertaining to over-production and the inquiry report had pointed out that the unit was authorised to manufacture 2.54 metric tonnes per annum (MTPA) of cement and 2.05 MTPA clinker. Its clinker production had, however, exceeded the limit and it produced 2.27 MTPA in 2010-2011, 2.29 MTPA in 2011-2012 and 2.97 MTPA in 2012-2013. Dr (Capt) GS Dhillon, Director-Principal, showed the chief guest around the school. She also visited the MiG-21 fighter aircraft and the state’s tallest flag mast of the Tricolour, displayed on the school premises. The flag was recently inaugurated by Vice-Admiral Anurag G Thapliyal. 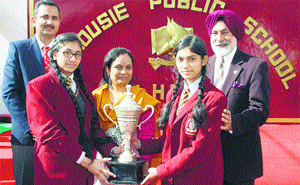 An inter-class school declamation contest preceded the investiture ceremony. The trophy of the contest was bagged by Dhananjay Sharma of Class X. In her address, Sudha Devi impressed upon them that the students should not become job seekers. Rather, they should rise so high that they become job givers. She reminded the students that they were 1 per cent of those lucky students in the whole country who were getting quality education, so they should work hard and become an asset for their parents and the society. Anand said the state had 48 lakh account holders in various post offices. In the first phase, all 18 post offices would be linked with core banking facility and 22 ATMs would be opened. In the second and third phases, core banking facilities would be extended to all the 446 sub-post offices and 2,500 branch post offices, he added. The Chief Post Master General said the post offices would soon extend electricity bill payment facility to the power consumers. The Postal Department was already in the process of entering into a Memorandum of Understanding (MoU) with the Himachal Pradesh State Electricity Board on the issue, adding that this facility would first be launched in Shimla Division and gradually extended to other districts. The Postal Officer said process was on for linking the state’s post offices with the central data hub for registered letters and speed posts, allowing on-line and real-time tracking of mails. Assistant Post Master General LR Dohia and Superintendent, Posts, Una, DR Sharma, were also present, besides local customers of the department. The police said the driver was working with Arvind Guleria of Kandwal and was returning after leaving the latter’s daughter at Pathankot. Near Bhadroya, a Ford Fiesta car chased and stopped his car. Four youths dragged Anil out of the car and thrashed him. They reportedly fled with the Polo car and left their car, which was without a number plate, on the spot. The victim rushed to Kandwal police chowki and reported the case. DSP Manoj Joshi said a case under Sections 382 and 34, IPC, had been registered against the snatchers. He took possession of the car left behind by the snatchers. Sources said Pappu Ram and Bhogunu Ram, both residents of Sameeh village, were killed when their jeep (HP 65A-0317) fell into a gorge while negotiating a turn. Both the victims died on the spot. A case has been registered.